Morgan Stanley reported a stronger-than-expected adjusted quarterly profit as revenue grew in all of its major businesses, particularly trading and underwriting. Net income attributable to common shareholders rose to $802 million, or 41 cents per share, in the second quarter from $564 million, or 29 cents per share, a year earlier, the Wall Street bank said on Thursday. Excluding special items, Morgan Stanley earned 45 cents per share, beating the average analyst estimate of 43 cents, according to Thomson Reuters I/B/E/S. J.P. Morgan Chase & Co. is in discussions with U.S. electricity regulators about paying what would be a record fine to settle allegations that the bank manipulated electricity markets in California and the Midwest, according to people familiar with the talks. The Federal Energy Regulatory Commission and the New York bank are exchanging drafts of an agreement that would result in J.P. Morgan paying hundreds of millions of dollars, these people said. The fine, they said, likely will be larger than the record $435 million fine levied by FERC on Tuesday against British bank Barclays PLC for its alleged manipulation of the California energy markets from 2006 to 2008. Barclays said on Wednesday that it intends to fight the matter in court. Bank of America Corp&apos;s balance sheet suffered from rising bond yields in the second quarter, suggesting that the second-largest U.S. bank may be more exposed to interest-rate risk than some of its major rivals. The bank posted a profit for shareholders of $3.57 billion in the second quarter, but on its balance sheet the picture was not as good - its net worth fell by $6.26 billion as a result of investment losses. Rivals JPMorgan Chase & Co and Citigroup Inc both managed to increase their net worth as measured by their book value. Dell Inc.&apos;s $24.4 billion buyout plan was foundering late Wednesday evening, as a group of big investors signaled their intent to vote against a deal that would remove the technology icon from the public markets. The new opposition from Vanguard Group Inc., State Street Corp. and BlackRock Inc. pushed the deal to a new level of brinkmanship, forcing Michael Dell and his backers to either sweeten the transaction or risk seeing the deal fail. Late into the night Wednesday, Mr. Dell and his namesake company and their advisers were weighing how to respond to the latest developments. People involved in the transaction said they were expecting to delay a scheduled July 18 shareholder vote on a plan that would award Dell holders $13.65 a share. The plan that Mr Peltz laid out is for Pepsi to buy Mondelez, a sweet snacks and coffee business that he said would complement Pepsi’s Frito-Lay food brands. Mr Peltz had a hand in creating Mondelez, pushing for UK confectioner Cadbury to spin out its drinks business, and then sell out what remained to Kraft. The chocolate maker then formed the core of Mondelez when Kraft undertook its own split last year. Trian wants Pepsi to buy the group with stock, in a deal worth around $65bn. Raymond James plans to announce on Thursday that it will use software from Hearsay Social, a start-up company based in San Francisco, to help its thousands of financial advisers use Facebook, LinkedIn and Twitter. The effort is among the more extensive efforts by a financial firm to mine the benefits of social media. The Hearsay software will be available to Raymond James’s more than 5,400 financial advisers in the United States. It will let them post from a library of prewritten material, as well as compose their own messages, which will be vetted before publication. An ex-con busted for his role in a Mafia-run Wall Street scam is a central figure in an unfolding scandal at the 92nd Street Y, the Daily News has learned. Salvatore Taddeo, who for years ran the Y’s contracting operations, is the focus of a kickback investigation by the prestigious upper East Side cultural institution, according to three sources familiar with the matter. ... In 1997 Taddeo, then a stockbroker, was busted along with members of the Genovese and Bonanno crime families. They were all charged with participating in a pump and dump scheme in which the mob would pay off corrupt brokers to hype stock in phantom companies in which gangsters secretly held stock. The fried chicken chain says it&apos;s opening a location called "KFC eleven" next month near its headquarters in Louisville, Ky., that will serve flatbread sandwiches, rice bowls, salads and only boneless pieces of its Original Recipe chicken. The name of the test restaurant is a reference to the 11 herbs and spices Sanders used in the "secret" Original Recipe. But the big news is that the restaurant&apos;s exterior won&apos;t feature Sanders, the avuncular, silver-goateed southern gentleman in a white suit and string tie, whose likeness has long been front-and-center at traditional KFC locations. 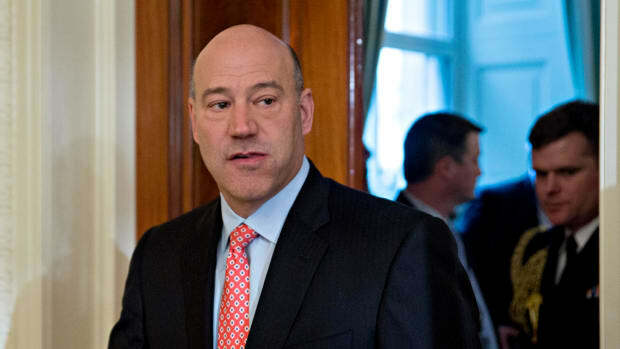 Inside Gary Cohn's unenviable White House job; Tim Cook dishes on Apple's autonomous car project; a thing called "potcoin" sent Dennis Rodman to North Korea; and more.